Currently the ratio of the electrification of South Sumatra Province has just reached 50.30% and the ratio of electrified villages of 96.40%. The PLN waiting list has reached 54,845 requests or for 62.3 MVA. 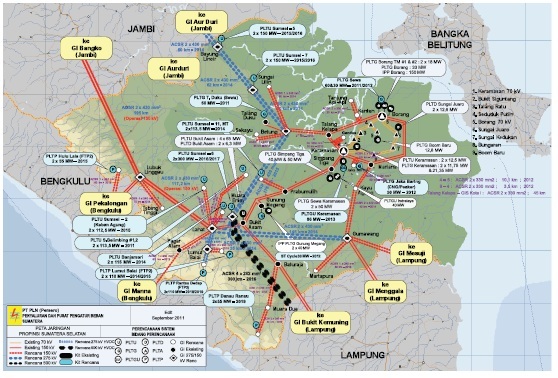 Aceh, North Sumatra, West Sumatra, Riau, Riau Islands, Bengkulu, Jambi, South Sumatra and Lampung electrical systems have been well interconnected with the electric power transmission lines 150 kV, known by the name of Sumatra System. Thus, the balance of power throughout the province represented by the balance of power Sumatra system, where in 2010 the capacity of the system can not meet peak loads that exist so that a deficit of 460 MW. As for the following years the condition of Sumatra System is in good condition. The assumption of population growth in the Region of S2JB estimated to average 1.2% per year while economic growth for the same period is projected at 5.7% per year, based on the assumption that the electrical energy demand is forecast to grow an average of 8.2% per year . Low Voltage Network 8330 kms. Electrical systems of South Sumatra Province, together with the province of Bengkulu and Jambi province have been well interconnected with over 150 kV transmission network which is known as South Sumatra, Jambi and Bengkulu Region System (S2JB). 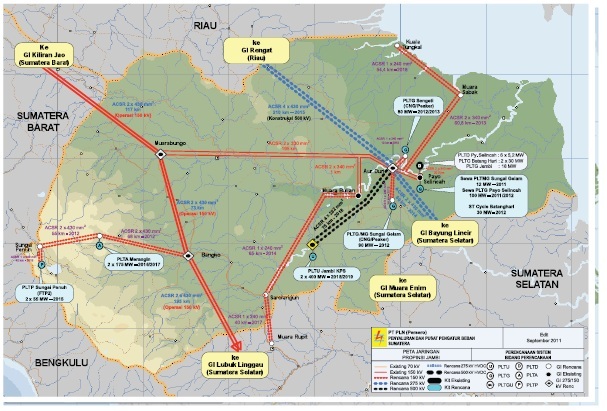 Almost all electricity demands(96%) in S2JB supplied by P3B Sumatra through 150 kV transmission network in Southern Sumatra Interconnection System (Sumbagsel) and the rest is supplied by power plants in isolated systems. Isolated systems in Jambi Province, among others: System of Muara Sabak, Tanjung Jabung Timur and Sarolangun. Of the four systems that supply electricity in the province of Jambi, two systems (System and the Tanjung Jabung Timur, Sarolangun) are in “Alert” and 2 other systems (System Sumbagsel and Muara Sabak) are in condition of “deficit”. Currently Jambi new electrification ratio reaches 51.41% and the ratio of electrified villages of 99.43%. The waiting PLN list has reached 31,371 requests or for 92.3 MVA. The assumption of population growth in the Region S2JB estimated to average 1.2% per year while economic growth for the same period is projected at 5.7% per year, based on the assumption that the electrical energy demand is forecast to grow an average of 8.2% per year . Low Voltage Network 7410 kms. Electrical systems of South Sumatra Province, together with the province of Bengkulu and Jambi province have been well interconnected with over 150 kV transmission network which is known as South Sumatra, Jambi and Bengkulu Region System (S2JB). 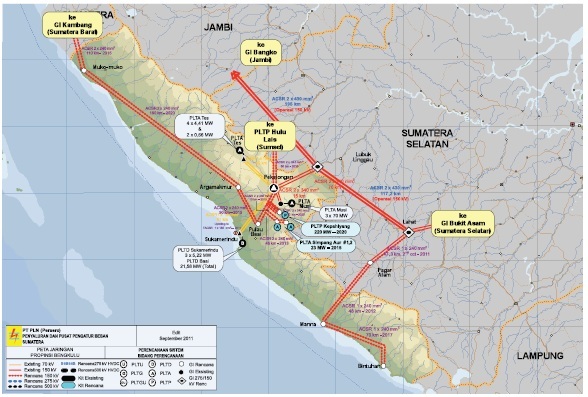 Almost all electricity demands(96%) in S2JB supplied by P3B Sumatra through 150 kV transmission network in Southern Sumatra Interconnection System (Sumbagsel) and the rest is supplied by power plants in isolated systems. Isolated systems in Bengkulu Province, among others: Systems of Muko-Muko, Manna and Kaur. 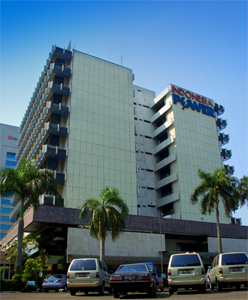 Of the four systems that supply electricity in the province of Bengkulu, two systems (Systems of Muko-Muko and Kaur) are in condition of “Normal” and 2 other systems (System Sumbagsel and Manna) are in condition of “deficit”. Currently electrification ratio of Bengkulu province reached 51.46% and the ratio of electrified villages of 92.21%. The PLN waiting list has reached 13,964 requests or of 16.8 MVA.